A composite bogie frame made of woven glass fabric and epoxy promises to bring about a 30% weight saving compared with conventional steel frames, corresponding to a 635 kg weight reduction per carriage. The bogie frame was developed by Korea Railroad Research Institute (KRRI; Gyeonggi-do, Korea). manufactured by KM Co. (Gunsan, Korea). The bogie frame in railway rolling stock is intended to support heavy static and dynamic loads, such as the vertical load exerted by the body of the vehicle, braking and accelerating loads, twisting loads induced by track twisting and traction loads. It accounts for approximately 20% of the overall bogie weight. The lightweight bogie system reduces wear on the rails and wheels, which consequently require less maintenance. Reducing the axle load is also a key factor for a railway industry that aspires to develop high-speed and high-capacity trains. Several prototype bogie frames have been manufactured and tested. 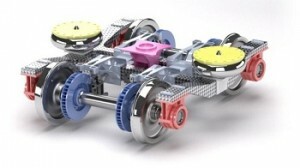 In 2011, the GFRP bogie frame passed a tight fatigue test under a repeated loading of 107 cycles. A full-scale running performance test using a roller rig testing system will be conducted in October this year. Subsequently, the main line test is scheduled for the next two years.